Enneagram Seattle - Laurie Rosenfeld | Laurie T. Rosenfeld, Inc. The Enneagram is a complex and fascinating system of personality that describes 9 core types or points-of-view, nine fundamentally different patterns of thinking, feeling and acting. Each of these types organizes attention and focus in the world very differently. Combining traditional wisdom with modern psychology, the Enneagram is a powerful, practical and dynamic system for understanding ourselves and the people in our lives. 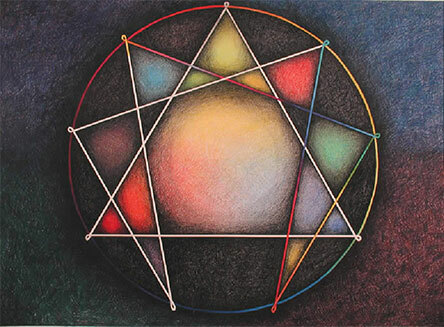 The Enneagram quite literally describes the 9-pointed figure that bears its name. “Ennea” is Greek for 9 and “Gram” means something written or drawn. The history of the Enneagram goes back hundreds of years. The Enneagram has been called a “liberation psychology”. The value in understanding our type is that once we see the patterns, or the “box” we have put ourselves into, we are no longer limited by it. Working with the Enneagram builds all domains of emotional intelligence. It cultivates our “inner observer” and brings our unconscious patterns to conscious awareness. Greater consciousness brings greater choice in how we show up in and react to the world. The Enneagram is used in counseling, coaching, business, and spiritual direction to help people learn about themselves and others in their lives. It is used in literary and film pursuits to assist with character development. For helping professionals and others interested in personal and professional development, the Enneagram offers a unique framework for self-observation and self-reflection that paves the way for transformational growth and change. The Enneagram is a powerful system that may be used to sharpen the self as an instrument of change.